On this page, I’ve given some background about me and how I came to start turning. 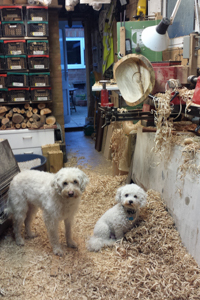 Whilst I will make almost anything in wood, turning is my first love – but don’t tell the wife! I enjoy the beauty and tactility of real wood. There is so much chipboard, mdf and other man-made material in all of our homes, it’s a pleasure to be able to work with the real McCoy. Part of the fascination is that you never know what you are going to find inside a piece of wood in terms of figuring. With experience, you might know what to expect, but each piece is unique and can be full of surprises. During my childhood, my father had a small table saw that lived in the corner of our garage. This was a combination machine that could, among other things, also be used as a small lathe. As I grew up, I was always fascinated by this machine. Time went by, I left home, got married, had children and got grey hairs, but the idea of turning still fascinated me. My day job dominated my life, which seemed to be little more than a treadmill of work, eat and (sometimes) sleep, so I decided to “get myself another interest”. By this time, my dad no longer did so much about the house and the saw bench just sat idle in his garage, so I started to drop hints! Then, one birthday, he brought it over for me. Sometimes, they even leave room for me! So that was when it all started – initially just as a hobby and limited to my spare time. The garage, which hadn’t seen a car in many years and was simply a junk/tool/cycle store, but soon became dominated by turning. I soon realised the limitations of this small machine and bought myself another larger lathe and various other “essentials” – every hobby needs them! 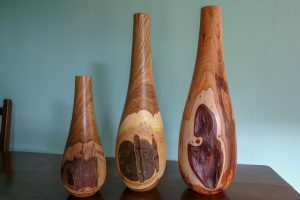 I gave up my previous career as a structural engineer in 2009, which allowed me to spend more time at the lathe and I then started selling what I made. That was initially difficult, as I confess to be quite a perfectionist and was never sure that what I made was good enough. But my confidence (and my ability) grew. To start with, I sold through the occasional local fair, but now I am a full time turner and also sell through larger events. I have acquired even more “essentials”, so the workshop/garage is now crammed to the point where there is just about room for me – and the dogs! 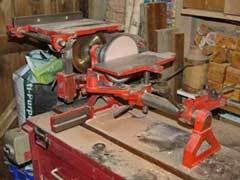 And I still use that first “lathe”, as you can see from the sawdust. 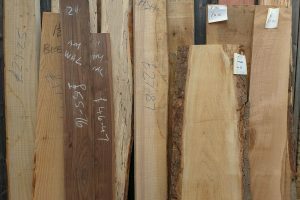 Not to turn wood any more, though – just as a saw bench or sanding table.